When Brother, Sister, and Honey Bear play ball instead of clean out their playhouse, will they ever finish their task? 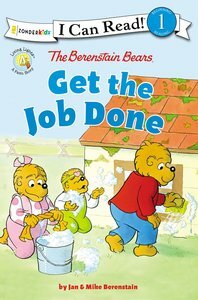 The Berenstain Bears Get the Job Done shows children how putting in a good day's work can be fun and feel rewarding. Young readers will appreciate seeing hard work pay off in Get the Job Done the newest Berenstain Bears® Living Lights™ Level One I Can Read. About "Get the Job Done (I Can Read!1/berenstain Bears Series)"
In The Berenstain Bears Good Deed Scouts Helping Hands, the Scouts extend helping hands to a well-known neighbor---Mrs. Grizzle. She is so appreciative, she repays them with lemonade and some memorable tricks...showing a chain-reaction of kindness in the Bear community.